One of the world’s last great expanses of wilderness is also ground zero for one of the world’s fastest rates of deforestation, scientists and environmentalists say. And nope, it’s not the Amazon. It’s an area known as the Gran Chaco, the second biggest forest in South America. It's a large, dry area extending more than 250,000 square miles spanning Paraguay, Bolivia, Argentina and Brazil. 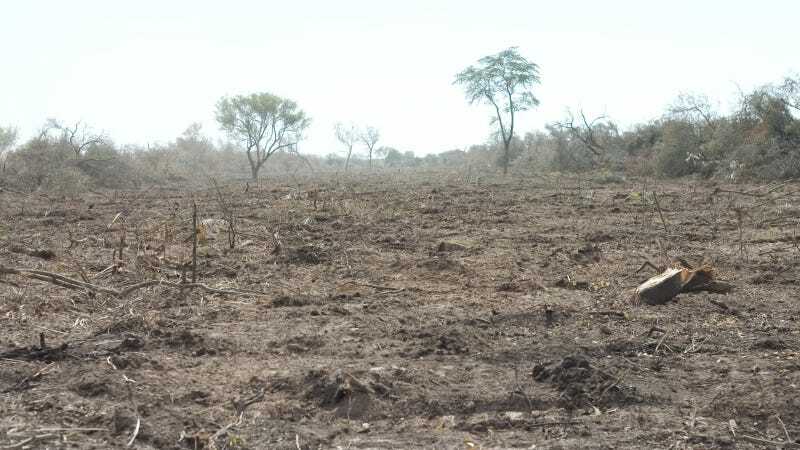 And it's disappearing at an alarming rate, especially in Paraguay, where trees are being felled to make room for cattle ranches and soybean fields. More than 14 million trees are being cut down every month, according to Survival International, a U.K.-based advocacy group. It’s not just biodiversity that’s under threat. The rampant deforestation is also encroaching on the jungle refuge of the last uncontacted indigenous tribe in South America outside the Amazon. Conservation group Survival International says the Ayoreo tribe is being pushed out of the forest they've always called home (their refuge is marked in red in the images above). Earlier this month, the Inter-American Commission on Human Rights urged Paraguay’s government to do more to help protect the Ayoreo.